With all the goings on over here, I almost, ALMOST, forgot to mention Swiss National Day. We even threw the Swiss-est lady in the house – my mum – a Fondue party. And I STILL let it slip past without a mention... Hopefully Switzerland won’t disown me. Don’t know what I’d do without Frey’s chocolate covered, caramelised almonds. Last year, I shared a Fondue recipe. This year, I’m sharing a Fondue Bestover recipe. Either, you over estimated how much cheese your guests could eat. Or, your guests don’t actually eat the quantities of cheese you wanted to think they did [just to make you feel better about your own vastly greater consumption of cheese]. Either way, you’ve got cheesy leftovers. Throw it away and that’s MONEY DOWN THE DRAIN. And good cheese. Obvi. So here’s what you do. Store the melted cheese – slowly congealing in your pot but still malleable – in an airtight container [will keep for 5-7 days] in your fridge until later use. And in the days to come, invite the neighbours, friends, friends’ siblings, all your wonderful cheesy-seconds, tell them to BYOB, gather all your fondue leftovers, throw on a game – the Olympics? - or an all time favourite cheesy chick flick – see what I did there – and serve them these... They - and the war on waste - will thank you for it. [Or at least, that’s how I imagine it would go. I’ve not actually managed to invite my cheesy-seconds over because in London, spontaneity – even for CHEESE – is just not a thing. But I am working on converting the masses…you'll see, spontaneity will be the next 'sorry I'm actually busy everyday for 3 months']. HOW DOES THAT NOT SOUND LIKE THE BEST FONDUE BESTOVERS PARTY. nibs etc. original recipe. Makes 1 – easily multipliable depending on leftover quantities/number of cheesy-second guests. First make the ‘hummus’ dip: into a small hand blender add you carrot top pesto, salt, olive oil and drained beans. Blend until uniform puree is formed, adding salt to taste and olive oil until desired thickness/consistency is reached. For the toasties: turn your grill/broiler onto it’s lowest setting with the oven fan on, if possible. 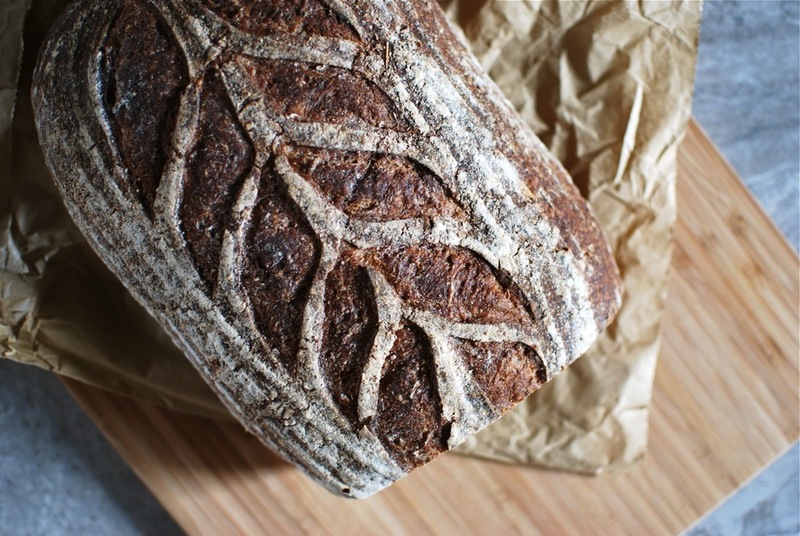 Slice a 2cm thick piece of leftover bread – day/two-day old is absolutely fine! – and slather with 2 teaspoons of the Pesto-Bean spread. 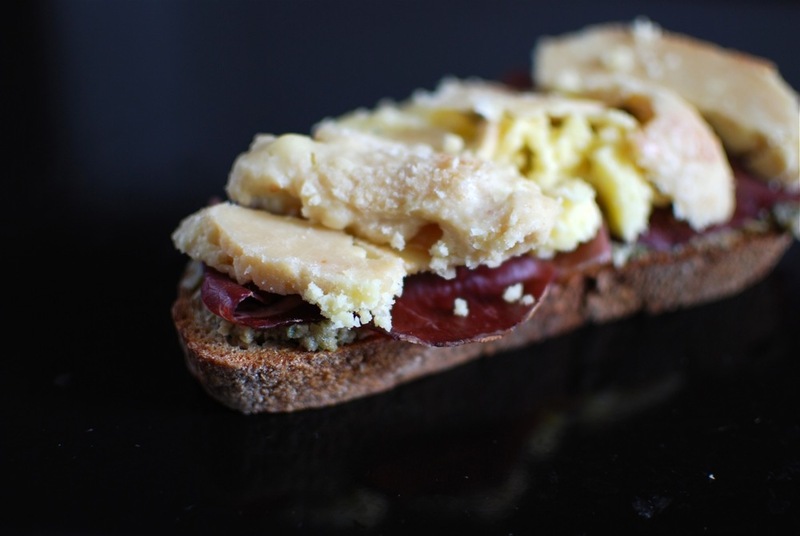 Top with 3 – or more should you wish – leftover slices of Bresaola. Top with pieces of congealed, fridge-chilled fondue of about 1.5cm thickness, so that the entire bread slice is covered. Place on your baking sheet, under the grill for 2-3 minutes until the cheese has melted to the point of slight browning on top and or around the edges. Remove, serve with cornichons, and devour immediately. Substituting the Pesto-Bean spread for any other green or red pesto of choice. Using alternative dried meats leftover from your Fondue night. Serving with a side of greens – mache/lambs lettuce + avocado, for example – or topping with a fried egg, Croque Madame style. Sandwich two of these together for the ultimate Fondue Bestover Grilled Cheese.